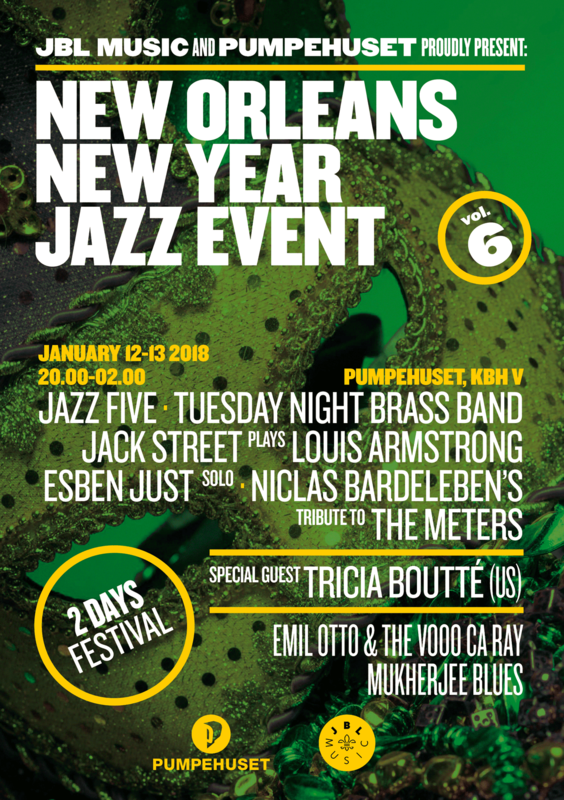 New Orleans New Year Jazz Event takes place every second year second weekend of January in Copenhagen and celebrates young funky New Orleans music in Denmark. During the years it has presented bands like Six City Stompers, Esben Just, Wonderbrazz, Jazz Five, Tuesday Night Brass Band, Astro Buddha Agogo, NOLA Love and Mardi Gras Indian, Gerald French (US). Next festival takes place January 12-13 2018 and will present bands and artists like Tricia Boutté (UK), Jazz Five, Tuesday Night Brass Band and Esben Just.